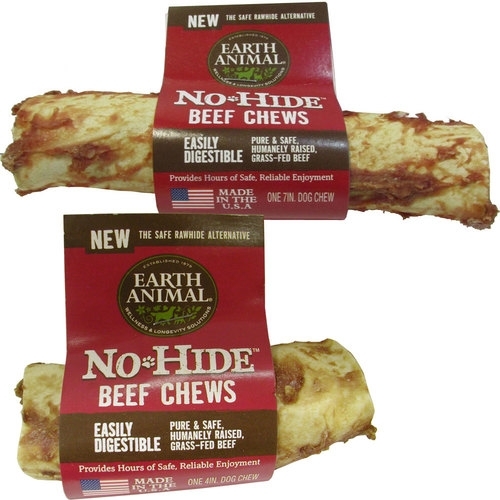 Earth Animal No-Hide Beef Chews for Dogs | All Things Woof Meow, Too Inc.
Earth Animal Beef No Hide is a delicious and long lasting chew that is a safe alternative to rawhide. This 100% digestible chew is made with humanely raised chicken that is rolled and baked with organic eggs and olive oil. This process creates a flavorful snack that will provide hours of chewing fun. An added benefit to providing chew treats is better dental hygiene. While your dog chews on No Hide treats, it will gently help scrape plaque and tarter off the teeth. Earth Animal Dog Treats are Proudly Made in the USA at an USDA inspected Human Food Facility.